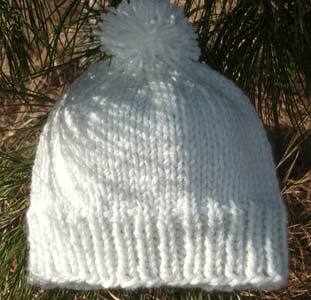 New Handmade Stockinette Beanie with Pom Pom – Homespun Look. Eggshell/Off-White color shown. Wear as a ski hat or close to head. Single ribbed brim keeps shape without stiffness. Knit in the round, reversible, no seams. Thick and warm. 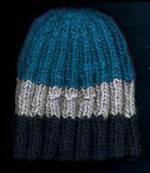 100% Acrylic, knit – with double strands, or famous Brown Sheep Wool/Mohair. Size Small to Medium Women’s – 19 1/2″ circumference stretches to approx. 23 3/4″. Height: approx. 8 1/4″. Size Medium to Large Women’s – 21 1/2″ circumference stretches to approx. 25 3/4″. Height: approx. 9 1/4″. Acrylic – Machine wash warm and tumble dry low. For best results hand wash and lay flat to dry. Brown Sheep Wool/Mohair – Hand Wash and Dry Flat. This yarn is permanently moth-proofed. What makes it different: The pom pom buttons in securely. The multiple decreases at the top and wider stitches in the body make for a smooth look with room for thick, gathered hair. For other color choices, please email with color name or see https://www.brownsheep.com/yarns/lambs-pride/ and email us to check for availability.